This article by Andrea Germanos is re-posted from Common Dreams. 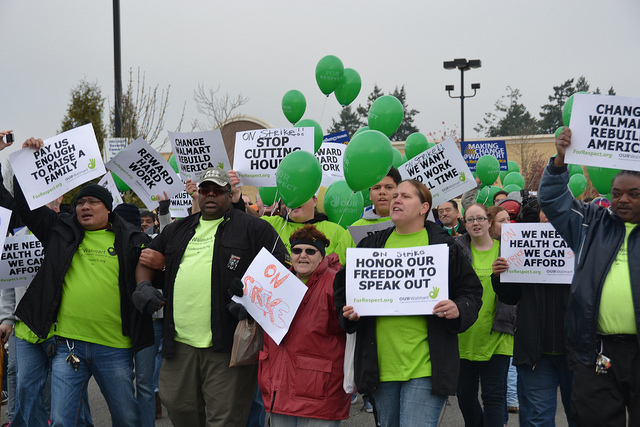 In what some see as an attempt to muzzle critics, Walmart is suing a union and other groups over protests that sought to highlight the retail behemoth’s low pay and poor working conditions. The lawsuit targets the 1.3 million-strong United Food and Commercial Workers International Union (UFCW), OUR Walmart, which is made up of “associates” of Walmart, and another group over repeated protest actions in over a dozen states, Bloomberg reports. Wal-Mart alleged that the defendants violated Florida law through coordinated, statewide acts of trespass in several Walmart stores over the last eight months. What the suit is really about, say some of the defendants, is silencing criticism of Walmart’s corporate, and union-preventing, model. “Rather than creating good jobs with steady hours and affordable healthcare, Walmart’s pattern is to focus its energies on infringing on our freedom of speech,” Reuters reports OUR Walmart as saying in a statement. Even though Walmart employs just under 1 percent of the American workforce, most of us live in the Walmart economy. Its model has been forced on contractors and suppliers, adopted by competitors and mimicked across industries.